The Residence is situated in a quiet position in the middle of the green, a few minutes walk away from the centre of Lipari. 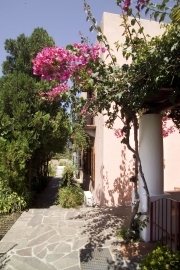 The Residence features a group of 18 small villas built in the island’s typical style. It has a cosy breakfast room and a Bar. The apartments are nicely furnished and are composed of terrace - some with an own garden -, patio, bathroom with shower, kitchenette with fridge, satellite-TV, air conditioning, heating, telephone, safe and hair dryer. Highway “del Sole” (Salerno-Villa San Giovanni free of charge), once arrived on Sicily, proceed on the Highway Messina - Palermo, off-ramp Milazzo - Isole Eolie - Harbour. Take the ferry or hydrofoil to Lipari. With the ferry or hydrofoil from the ports of Napoli, Messina, Milazzo, Palermo and Reggio Calabria. We can arrange transfer from Catania Airport to Lipari and vice versa upon request.